That was my first question when I heard Anne Burrell telling her students on Worst Cooks in America to make this dish. I had never heard of it before, which is surprising since I’m Italian and all the women in my family cook delicious Italian dishes. Turns out Chicken Saltimbocca is a phenomenal combination of chicken, prosciutto and spinach. This dish is already very keto friendly, so it only required a few minor adjustments and we were feasting on an Italian classic. The kitchen is already the place that I go to when I need some stress relief. One of my favorite things in the world is to throw some headphones on with a good podcast and disappear into the kitchen for an hour cooking a new and creative dish. This dish has the added stress relieving element of pounding the chicken with a hammer! Does it get better? It’s important to get the chicken nice and thin for this dish, that way it will be easier to roll up and will also cook more evenly. We just used a normal hammer since we didn’t have a kitchen mallet, so that’s always an option! This recipe is delicious, but some of the ingredients can be a bit pricey. For example, prosciutto is going to cost you an arm and a leg, and a nice block of Asiago cheese isn’t cheap either. We always encourage you to just use our recipes as a guide and make changes as you see fit. You can change up the meat and the cheese if you’d like. Provolone and some deli style ham would be another great combo for a fraction of the cost. 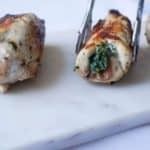 This recipe is higher in protein than a traditional keto meal but that can be fixed! This chicken saltimbocca is just asking to be doused in olive oil. Be sure to drizzle a healthy amount over top as you serve! Place 1 slice of prosciutto onto each piece of chicken. Evenly divide spinach and asiago cheese onto each piece of chicken. Roll up the chicken and place a toothpick through each piece to hold it together during cooking. Heat a pan over medium heat and add 2 tablespoons of coconut oil. When the oil is up to temperature add the chicken. Cook for about 30 minutes total. These take a while to cook due to their size, be sure they are cooked through. Drizzle olive oil over top when serving. Enjoy!